A storybook town that was once Bermuda's capital, St. George's is also famous as the second English settlement in the New World, after Jamestown. A World Heritage Site, it's a maze of quaint narrow streets with names like Featherbed Alley and Old Maid's Lane (two worth a look are Shinbone Alley and Silk Alley). Want to head out of town? Taxis are expensive, and taking the local buses can be time consuming. St. George's also played a role in the American Revolution. Bermuda depended on the American Colonies for food, and when the war began, supplies grew dangerously low. Without the approval of the British Bermudian governor, George Washington and Henry Tucker struck a deal: gunpowder for food under the cover of night in Tobacco Bay. King's Square is the best spot for unfolding a map and heading for the sights along the tiny streets and lanes (the Visitors Service Bureau is there, ready to hand over self-guided walking tour brochures and maps). 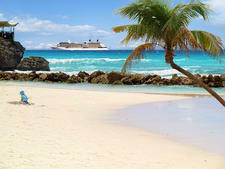 Beckoning beaches include Tobacco Bay, which also happens to be a snorkeling paradise, and Achilles Bay. You'll tie up in Ordinance Island (merely steps from King's Square). Everything you want is really close at hand. 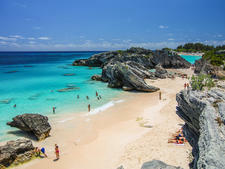 Bermudians drive on the left and car rentals aren't allowed, leaving visitors with the options of mopeds, bikes, taxis, ferries and the cotton-candy pink bus system. Sure, those scooters are cute and you'll be tempted to rent one, but we suggest thinking twice if you're a newbie. The roads are narrow and winding, and you'll find yourself spending a good deal of time getting out of the way of speeding locals who don't care whether they pass on the left or right -- to say nothing of that cumbersome left-side driving detail. If your mind is made up to take a scooter, you should still consider a taxi for evening outings and rainy days. You don't need a driver's license, but you do need a helmet and insurance (the rental company includes both in the rental fee). You also must be over the age of 16. Ask about multi-day prices (about $60 for two days, $81 for three); otherwise, plan on $38 for a one-day rental (scooters built for two will run $55-$65). Rentals are available from Oleander Cycles on York Street. Conventional bikes (livery cycles to the locals) are rentable for about $20 a day at just a few shops throughout the island (contact Oleander for the closest location carrying livery types) -- but since Bermuda is known for its steep hills, it might prove to be a bit of a challenge. If you don't want to splurge on renting a bike helmet, bring one from home. The pink buses travel along all major roadways making stops every 15 minutes, except Sundays and holidays when it's every hour or not at all on some routes -- and it's really not a bad way to sightsee. That's the good news. The bad news is they'll eat into the time you have on the island. Using the Orange Route buses, the trip to Hamilton takes an hour -- though an express bus will cut the time by 20 minutes. You'll need exact change in coins (or tokens) for the fare box (St. George's to Hamilton, for example, is $4, ages 5 - 16, $2, under five, free). Transportation Passes for one or three days are also available for unlimited use for all zones for $12 and $28, respectively. For $2, hop on the year-round St. George's Mini-Bus from 7:30 a.m. to midnight for getting around St. George Parish and St, David's Island. They leave from King's Square -- but you can flag them down along the roadway. Time-saving ferries crisscross the Great Sound between St. George's and Hamilton (1 3/4 hours) and King's Wharf (1 hour) for $4 (kids pay $1), but cash is no longer accepted. Tokens are available at the Hamilton Ferry Terminal, the Hamilton Visitors Service Bureau and the Central Terminal, also in Hamilton. Take mopeds and bikes onboard for routes for an additional $4. Schedules are posted at the landing. Taxis are plentiful but pricy (the first drop is $4.50). If you want to use one for sightseeing, we suggest taking ones that have blue flags on their hoods. That means the driver is government-qualified. Fares increase by 25 percent between midnight and 6 a.m., Sundays and holidays. There is a taxi stand in King's Square, close to Water Street and the Cruise Ship Terminal. Note: The Visitors Service Bureau in King's Square (Monday - Saturday 9 a.m. to 5 p.m.) is where to get bus tokens and Transportation Passes, maps and other information before setting out. 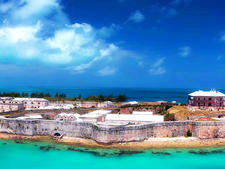 Also available here is the Heritage Pass, priced at $25 per person, which gives you access to six cultural attractions within a 7-day period: the Bermuda National Gallery, Bermuda Aquarium, Museum & Zoo, Bermuda Maritime Museum, Bermuda National Trust, Bermuda Underwater Exploration Institute and all forts. Legal tender is the Bermuda dollar, which is divided into 100 cents. BD$1 = US$1. U.S. currency is normally accepted in shops, restaurants and hotels, but currency from Britain, Canada and other foreign countries is not. Exchanging money is easy, whether it's at an ATM or a bank. 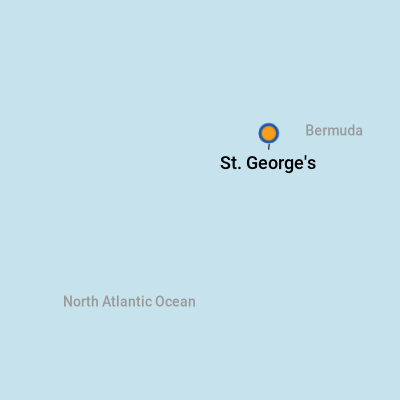 The Bank of Bermuda and Bank of Butterfield are in St. George's, open Monday - Friday 9 a.m. - 4 p.m. Both have ATMs. For more currency exchange information, visit www.oanda.com. Note: Bank of Bermuda's ATMs can only take four digit-PINs. 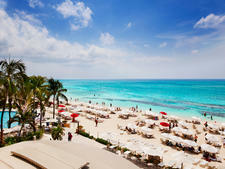 You'll find plenty of traditional dishes like fish chowder laced with black rum and hot peppers, and hashed shark. Note: Order anything made with their fabulous Bermuda onions. Food for thought: Norwegian Majesty's Bermuda Freestyle Dining Ashore Program gives cruisers the opportunity to try any one of a dozen-plus first-rate restaurants. We love Carriage House for both lunch and dinner. Pay $5 and get a lunch voucher worth $25 or $10 for a $50 dinner voucher. Black Horse Tavern: Shark hash and celebrity sightings. Per-person cost for three courses including wine will run about $25. Tuesday - Saturday 11 a.m. - 2:30 p.m., Sunday noon - 3 p.m. St. David's Rd. Carriage House: Expensive, but worth it. They carve the rack of English spring lamb tableside. Their signature Bermuda Triangle -- filet mignon, shrimp and chicken breast -- is a top choice. Per-person cost for three courses including wine will run about $25. Daily 11 a.m. - 2:30 p.m. 22 Water St.
Freddie's Pub on the Square: Popular hangout for English fare. Try the shepherd's pie; it won't disappoint. Per-person cost for three courses including wine will run about $25. Daily 11 a.m. - 3 a.m. 3 King's Square. San Giorgio: Italian fare with great views. We say stick with the pastas. Per-person cost for three courses including wine will run about $32. Reservations recommended. Daily 11:30 a.m. - 2:30 p.m. Water St.
White Horse Tavern: Would you believe us if we said the Philly steak sandwich was to die for? Per-person cost for three courses including wine will run about $25. Daily 11:30 a.m. - 4:30 p.m. King's Square. Under the heading of "best deals" are U.K. imports, such as nice cashmere sweaters and Harris tweeds. You're shopping duty-free, so that means prices are at least 20 percent less than the U.S. You might get closer to a 40 percent range at some places, but prices aren't as good as they once were. You could also buy ginger beer (we think it's an acquired taste) and Gosling's rum to make a Dark 'n' Stormy back home. And don't forget the Bermuda shorts! A rum swizzle (rum, apricot brandy, brandy, honey, lemon and lime) at the Swizzle Inn, considered the inventor of the drink. When you're done, stop in their gift shop and buy a swizzle rum cocktail shaker for concocting them back home.